I have only a few words for this new video from Team Squirrel – just WOW! Very inspirational – really makes we want to fly even more. 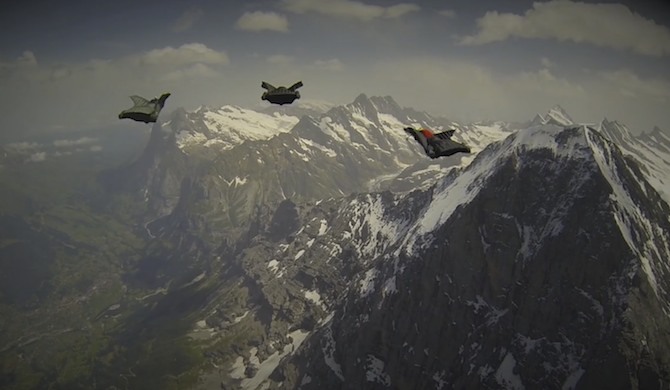 With the new release of the documentary “Birdmen: The Original Dream of Flight”, Team Thirteen have created an honest and exceptional view into the world of wingsuit base jumping. Matt Gerdes, Mike Steen, Ellen Brennan and Loic Jean-Albert share their world with all of us, and takes the viewer to the very edge of the cliff and beyond. I for sure felt like I was there, flying full speed past the steep landscapes, diving into canyons and cracks! A documentary that stays true to the base jumping community in every sense. Unlike most other base jumping related documentaries shown on TV, where every third sentence contains words like death, if they make a small mistake, illegal or adrenalin junkies, this documentary takes us through the evolution of wingsuit skydiving to base jumping proximity flying. Matt, Mike and Ellen speak their minds and invites everyone along, invites everyone into their beautiful world of human flight. Anticipation, Silence, Focus – the true feeling of the moment before stepping off the edge! 'BIRDMEN' is the first documentary ever made that covers the past, present, and possible future of the sport. Base jumper or non-base jumper. Pay the small rental fee and put it up on a big screen with volume set to LOUD! Rent it or Download it here!